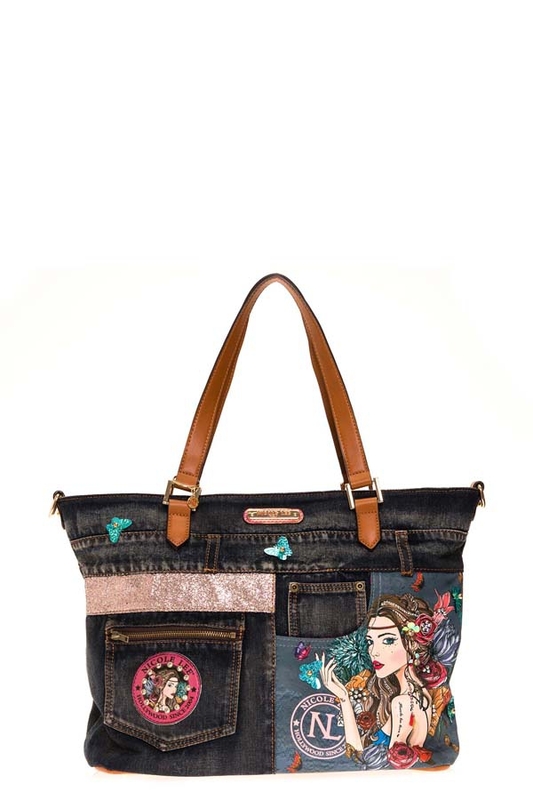 Follow your dreams in style with the Nicole Lee "Angelina Follows Dream" Denim Shopper Bag. Exterior Features: Made of denim. "Angelina Follows Dreams" design at front. Butterfly appliques. Vegan leather top handles. Metal zipper closure with NL monogrammed zipper pull. Detachable shoulder strap. Open front pocket. Single patch pocket at back. Vegan leather structured bottom. NL nameplate at front. Interior Features: Large main compartment, zip wall pocket with NL nameplate at back, double open wall pockets at front, vegan leather key chain strap and NL polka dot logo nylon lining. Vegan leather handles with 7" inch drop. Color available Angelina Follows Dream.